Ah the snow is back! Last night it was pouring down rain when I went to bed. I woke up to fur inches of snow. It has been raining ever since! Tomorrow will be a quiet sort of day, just the type to clean up my sewing room. I have new ideas of how it should be organized. I hope I muster the necessary hard nosed determination to de-clutter some "cute" things I have been hanging onto. I have many things to look at that I can't seem to find a home for. These things have me stuck in a cluttered mode that leads me to believe that perhaps if the object in question has no place to fit in I need to re-purpose it or let someone else re-purpose it! Once I reorganize I can just pop into the room for a quick 10 minutes of sewing or a marathon of sewing a complete project. That was the purpose of the room in the first place. Wish me luck. 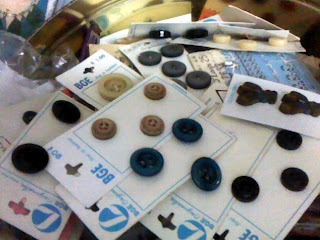 I like buttons...I have two containers full and an odd assortment of cards and tags with buttons from long forgotten and long donated clothes. My question is....do you save buttons from your worn out clothing? Or...do you buy items from a thrift shop because of the buttons? I have buttons of bone...buttons of brass...ivory buttons or pearl buttons! Tortoise shell buttons or silver buttons. How about rhinestone buttons? Covered buttons? Oh my but the options are unlimited and all lovely. Here are just a few from my overflowing old fruitcake tin! Merry Chri stmas! What a splendid season this has been for me. I feel very blessed to have a wonderful family who gathered at our home last night for a fun celebration. The children were so excited but I wonder if I was even more excited! Games and food, lots of goodies but most of all the laughter and special smiles from loved ones. Our tree (pictured left) makes a lovely centerpiece for the presents and games that followed. For the second year I named each grandchild with a reindeer name. All of their presents are labeled with their reindeer nickname. It is fun to see the big reveal when I hand them their Reindeer Name Tag! Next comes another fervent look at the presents and the guessing goes on. The excitement is really a big part of the party for me so for a child it is intensified. This year presents followed a delightful dinner of prime rib roast and roasted potatoes with rosemary. We had fresh green beans dressed in lemon zest and pine nuts, fresh cranberry sauce and wonderful whole grain artisan bread. Plenty of cookies, candy, gingerbread boys and caramel corn. Oh the visions of sugar plums danced vividly in my home as we gathered to celebrate. Thank you Lord for giving me such a wonderful family. 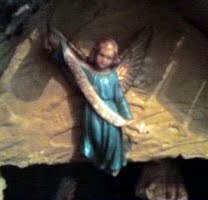 You are the reason for the season and You were a welcome guest at my side. Thank you too for showing me the way to keep things in perspective as I prepared myself for Christmas, one that was truly memorable. Christmas is many things to many people but to me it is a time of wishing for the perfect day full of love. I am sentimental and cry during Christmas movies. They seem to have a theme in general though and the rub is getting a new spin on the story so that people will watch for more than five minutes. In the end, there is a redeeming factor, whether the guy gets the girl or the scrooge -ish man finds the world is wonderful after all. I don't recall a sad ending for a Christmas movie and maybe that is why I usually get hooked easily into watching. 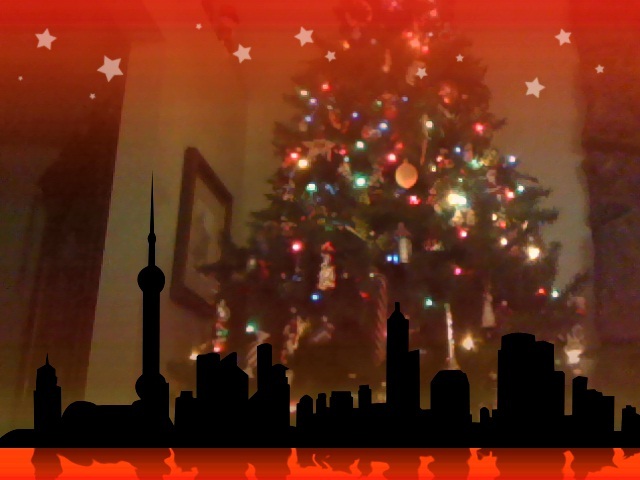 I wish everyone a happy ending to this year's Christmas Day, one that will be memorable and full of family. 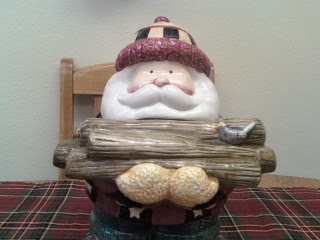 I wanted to do something special with my little papier mache Santa. He is so small and cute with his elf-like qualities. Often he can just get lost in the midst of such a collection. 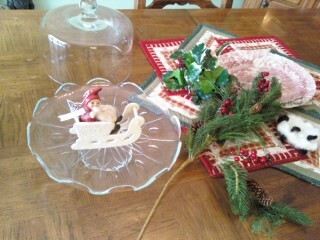 So with wire cutters in hand I transformed a crystal cake platter with a large "bush" of greenery from JoAnn Fabrics. I like the size of this plate and the effect of the pedestal. I like the reds, the greens and golds. 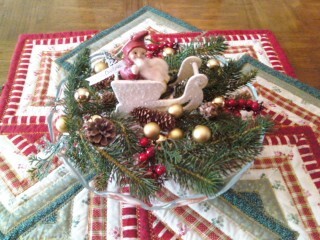 The table topper is one I made two years ago. I love his sweet hat and his cute little eyes. He is fun to look at. I nearly put him under glass...but I love seeing the sparkle of the sleigh and the softness of his cotton tuft of a beard. It just wouldn't do to hide him under glass! 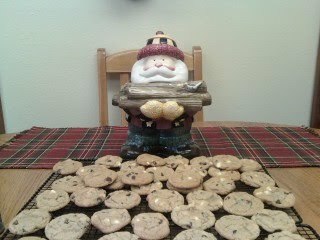 Santa Says....fill me with Christmas Cookies soon! A quick look shows he is full of cheer waiting to put the logs on the fire. A few moments of watching his sweet face and I reminded myself that my grandkids would be stopping by after school and poor Santa was empty! Children are hungry after school. Cookie Jars on tables, especially Santa Cookie Jars are inviting and woe is the disappointment in the heart of a child, especially a hungry child who opens a cookie jar to find it empty. I have not started my cookie baking yet and hadn't decided what to make first so I quickly made a batch of good old fashioned Chocolate Chip Cookies. The last pan came out of the oven just minutes before they arrived. It was fun to see them take in the Santa and the cookies warm from the oven. I was so happy to share their afternoon with them. I added some white chips to the batter, hoping they didn't mind and they didn't...my grandson looked at me and said "You make the bestest cookies." Oh that made all that scurrying in the kitchen so worthwhile, the appreciation of those special children! These unplanned moments are the ones I treasure the most. Now to plan my baking schedule for Christmas! This is the Feast of St. Nicholas. When I was a child, my family celebrated this old German tradition of receiving treats from the good saint, who eventually became Jolly old St. Nick! The story held that children put their shoes out on the step and on the following morning, December 6th, they found treats in the shoes. We didn't put all of our shoes out overnight though; imagine 10 pairs of shoes out at once! In our home, one of the big kids went to the door while we ate breakfast and found" two huge bowls with candy, or nuts or fruit....it was pretty exciting. In my minds eye there never was such big bowls of treats! 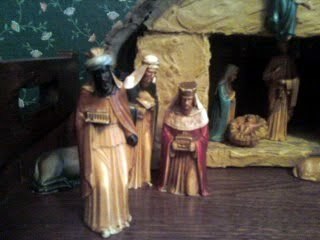 Today, I am enjoying my Nativity Scene. 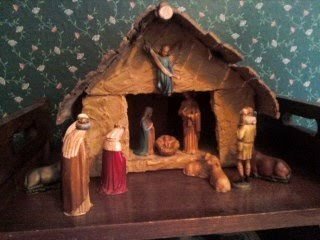 My husband built this stable, finishing the outside with leftover grout from one of our tiling projects. He made roof the roof from the bark of a tree he chopped down from the back yard. The stable has a second story balcony inside, with a railing made from twigs left from the tree. I bought the little statues from a favorite long gone Department Store called The Crescent. I believe they were on sale for $12.00 about 50% off. At the time, 1977, that was spendy but they were just right. This past month I focused on giving more of myself for the Thirty Day Challenge. Money is not the only way to give to others and I found focusing on others to be rewarding while learning more about people. Often times while driving I can lose my patience quickly if the traffic conditions or actions of others is not to my convenience. I learned that this is just not always about me. Others can be just as impatient. Now and then I practice an exercise that I implemented regularly in November. That little practice is a simple smile when I encounter other drivers. Are they turning left in front of me? Can I take time to let someone in my lane when the lane is blocked ahead? I find that a smile, even across steering wheels goes a long way. A quick smile back tells me that they are more relaxed....or a little more patient. Taking time to think of things to do for others at home also has a positive result. When I stop to think of how thoughtful my husband is it can be a challenge to anticipate something I can do for him. The secret is in the small things like keeping up with routine household chores that are only noticed when they got missed for a day or two. Clean socks, every day...dinner on time or providing a safe haven from stress are invaluable. I can't go into each and every mundane thing but...they are important. Little things that I take for granted are so appreciated by others and if it is a chore I don't especially like the more I know it was received with grace and a feeling of gratitude. I am going to continue working on this during the month of December; it is a rich way to live and the blessings are innumerable although I am not doing this for my own grattification, it rewards me too! I can't wait to try this bib I made today on my grandson! He will love the monkeys. I like the color combination! I love to sew on whimsical fabrics. I would enjoy finding this soft waterproof fabric in other colors and prints. I don't believe this is vinyl yet it is too soft to be any of the oilcloth fabrics I have felt lately. It looks like a research project in the making. 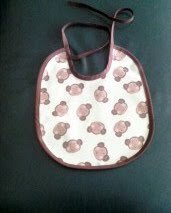 In the meant time I will look for other things to make with the monkey print. My brain is full of ideas now for time to put them to work! In the meantime, I know this bib will be more comfortable than the others with smaller necks and Velcro. I have caught the hair of many a child with Velcro and in my experience, it is easier to get a tie untied without catching the hair of a little one. Now that he likes to "feed" himself, the waterproof aspect is a plus! 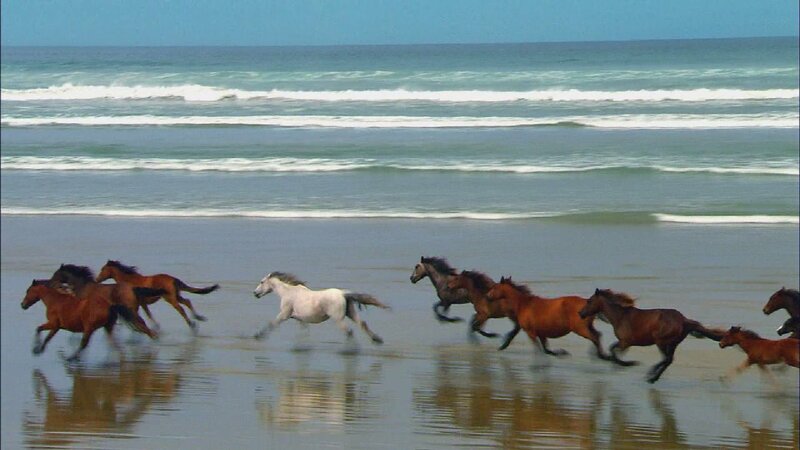 This is looks like a scene from my window today. The snow cannot deter children from having a good time outdoors. 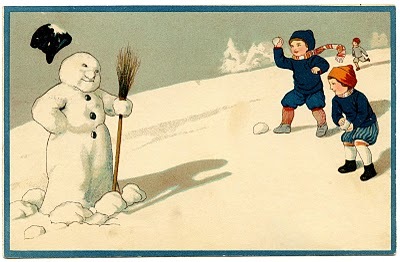 I wonder how warm children in this era stayed in their sweaters and knickerbockers. all dressed up in a tie and jacket and his knickerbockers. I bet he was glad when he could wear trousers "below his knees!" What a lazy Sunday afternoon! The temperature is cool, a mere 27 degrees; the house beckons me to relax and be still after our busy Thanksgiving week. I have the luxury to stay indoors to enjoy the snow while others are out braving the weather. It will be a slippery drive for those going back to work and school tomorrow. The city is working overnight to keep the roads plowed and de­­­-iced. Imagine trying to drive in 17.9 inches with ruts made from drivers who slid their way down the road. I am thankful for the plowing crews who are working straight through their schedule to get it done. I have an apron waiting on my table to sew for Thanksgiving. It is going to be my first bias tape bound apron and I am excited to get started. This will be a good way for me to remember those who gave me my passion for cooking on this wonderful day. My mother made cobbler aprons in many colors with coordinating bias tape. I am excited that this tradition of retro aprons is popular as they are symbols of those days when the kitchen was the heart of the home where families sat down for dinner together. I also have one apron that my grandmother made and gave to me in 1965. She made them from gingham and embroidered wonderful teneriffe patterns on them. It will be hard to decide which of my two daughters to pass them along to! I treasure this apron because it is such a good memory of my grandmother. Today I was at Costco, shopping for m Thanksgiving cooking spree. It was busy. Food tourists gathered aisle wide for tastes of bread with butter or a little Greek yogurt, salsa soup and my... oh my who knows what else. It is a boost for sales and a bust for my zipping merrily through my list. The lines were long and my cart was heavy. While I waited in line I watched the people, intrigued by what they had in their carts. It amazes me how much I can miss when I see someone with a great new toy or a good looking wheel of Brie but not enough to give my space in line! It was good to slow down and watch. Sometimes that isn’t easy. Traffic…carts, people Oh it was busy…even walking out to my car. After I finished unloading my groceries, a nice young man took my empty cart with his and put it away. How sweet and it made up for all the near traffic jams inside the store! I wonder if he is participating in the Thirty Day Challenge! I love Thanksgiving. I enjoy planning for it, baking for it and pondering whether I should try something new or keep the same traditions. This year I will be blessed once again with family around the table and memories of holiday dinners from long ago. I remember being so nervous roasting my first turkey. I got lots of advice from my sister, and then absorbed every word about roasting turkeys in my Betty Crocker Cookbook. It turned out to be far easier than the first pot roast I made for my new husband all those years ago. I had to laugh it was so easy; I decided from then on that Turkey Day would become my forte. Last year I replaced my old speckled dark blue roaster pan. I purchased that pan in mint condition for $2.50 at the neighborhood St. Vincent DePaul Thrift store. I used that roaster for more than 30 years when finally, the finish was kaput. I wanted to hang onto it for the longest time because I get sentimental about these “treasures.” When Thanksgiving rolled around and I used that new roaster for the first time, all sentimentality for that pan was forgotten. Even my gravy was a snap to make in the new model. I still remember and will remember the great feeling I had when I bought that old roaster because I learned to cook with that pan. Those are great memories. This year I am looking forward to the memories we will make this year in the kitchen. I will be joined by my cat, who will be camped out by the oven until everybody else comes in to supervise the progress of the feast. As I look at my grandchildren, I remember the faces of my little girls, so bright and excited ready to go outside for an adventure. Now mother's of their own, they are busy with their families and it is hard to believe that so many years have passed. Barbies, Strawberry Shortcake, Cabbage Patch dolls and books, boat rides and bike rides all filled their dance cards. What a treasure my memories are to me, and now I am building new ones with my grandchildren. Life is wonderful. This is a reminder for me to pause before the busy season comes across the Thanksgiving table with a new project or sale every day for the next month. It can be overwhelming if we let it, but honestly Christmas will not be any better if I get so busy I forget to savor the moments of tree decorating, a broken bauble or two and shopping with my husband. Ah, I do love this time of year even with the busy hustle and bustle. This morning my husband called me to share the sunrise with me. The sky was a glorious pink that soon shifted to a gold richer than the splendor of any jewelry I've ever seen. I had just texted him reminiscing the birth of our first child so it wasn't as if he roused me from sleep. Thirty five years ago today, our lovely daughter was born. She is an amazing woman now, and we couldn't be prouder of her. She is a wonderful wife and mother and has such a giving spirit. I remember the day she was born like it was yesterday! Where has the time gone? I fretted over her colic and worried about so many other things that nowadays I would take for granted. She slept through the night when she was three weeks old and when we woke, we jumped out of our beds so fast only to find her sleeping peacefully. What memories my husband and I shared over the phone. There are so many memories flooding my mind, it is like a whirlwind. It seems like I turned around and there she is a woman, no longer the baby I once held my arms. Oh I miss that baby, but I celebrate the woman she has become. I heard about the 30-day giving challenge recently, and decided to join. It is good to think of others in a world filled with ways to avoid contact with others for many days. Oh we can blog and email, and these enable us to avoid the phone or leaving the house. It can make me out of touch with the world if I give in to this solitary way of living. Of course, this is not a life I would willingly live on a regular basis. I crave human company, it is part of my nature. I enjoy those moments when I see a smile on a face that was unexpected. I love gifts, the kind of gifts that are the rare thought by someone who took time to see what was needed to make a difference in the life of another. I have received many of these gifts in my life, and these gifts helped me become the woman I am today. A wife, mother, grandmother, sister, aunt, cousin and friend. My life is richer because of these gifts and the price tag was insignificant compared to the giver. I am challenging myself to find ways to give for the month of November. I plan to touch lives, one person at a time, in a small meaningful way. I will not share with you what my gifts are, I wish to stand back and watch without recognition. I have not the riches of the world, but I can make a difference. Click on the 30-day button and see what you can do to help change the world. You will see the following quotes as listed below that inspired me. I hope they inspire you too. “Today is the day, You have made, I will rejoice and be glad in it…” I love these words and the lively beat in Lincoln Brewster’s version of this song. How often I wonder how I will spend the day, and make it a joyful time. Joy has many ways to pop up in our lives. This past month I pushed my enthusiasm to the limit. I sewed like I haven’t for years. My granddaughter asked me if I would be interested in helping her choir at school by mending their choir robes. I checked into this project with her teacher and brought home 19 robes in the first “batch” on the spot. Some needed hemming some had problems with the yokes and three needed new zippers. Separating zippers; you know, the kind that used to be readily available when fabric stores were simply “Fabric Stores” carrying all manner of fabric and notions. The project went fast and as I noticed the yokes that needed sewing down I realized I needed to go back and review the robes I didn’t bring home. What a stack I brought home on that trip! While the pile was big, the actual sewing time took less than taking the robes off the hanger and putting it back on! Not a big deal. But the zippers? I fixed one of them and the other two will be replaced by two good zippers in otherwise unusable robes that are simply beyond repair…something many resourceful women learned during the Great Depression of the/ 1930’s. My sewing room was blue all over, surrounding me and my sewing machine. I took ownership of the project. I liked it. I dreaded it. I pushed myself to start this and I am glad I did. I had been in such a funk and really needed to get out of it. My wise 12-year old granddaughter knew this would be good for me. In the meantime, I helped my daughter sew two skirts and made her a laptop bag. It was good to be back in the groove again. My mind is full of ideas like visions of sugarplums, only things to sew or crochet instead. The students made me a huge card, cleverly designed with musical notes and signed by all. It means a lot to me. What is most important though is the appreciation of what I could give. I called my granddaughter and thanked her for asking me to mend the robes. I know I got just as much out of the project as the students who will wear these robes during their performances. I am so blessed to have been asked to mend these robes, not for the glory or praise but for the opportunity to serve. It is a dark and peaceful night in the neighborhood, especially for Halloween. Not many children are stirring on my street. The new neighbors across the street are not home so adding their dark home with the remaining two on my side of the street it is pretty D-A-R-K! If I were walking my kids tonight I probably wouldn't turn down this part of the street, I would follow the light. Still, I have seen princesses, a cat and a super hero...one that was pretty darn tall. However, size is not always the measure one should determine for eligibility. I remember when I was 10 or 11 a lady decided I was too old would only give candy to my little brother and sister. I was polite but a little taken aback. I was tall but not too old. Alas, this young man, perhaps 13 or 14 was more child-like and his father looked on with thanks to me as I allowed him to take the last package of Skittles from the basket. The shiny red bag full of those colorful candies are always a favorite and he was excited to have that last bag. Too old? A matter of perspective. Halloween is a night full of possibilities when a child dons a costume. Make believe fun and visions of all treats imaginable. I listened on as the big kids told us about some of the treats of years gone by. Big 5 cent candy bars and a whole popcorn ball from Mrs. So & So. Of course some people gave big red apples and others had wonderful decorated cookies. When I went out I had some of those treats but as time goes, so does the treats of by gone years. Apples were tossed out when my kids were going out. The same for cookies or popcorn balls. Then came the days the fire stations x-rayed the candy for saftey. The news would have stories of apples with razor blades or laced with poison like Snow White...yikes! But boy do I remember those nickel candy bars; they gave way to dime candy bars only to move ahead to a quarter and eventually they just got smaller and the price got bigger! Mrs. Anderson, an elementary teacher in our neighborhood always had us come inside to sign a guest book and talked to each of us about our costume. Nowadays, we see neighbors we don't know except for the color and make of their cars. Nobody would think of asking the kids inside for an autograph either! Times have changed, but one thing is the same...the little ghosts and goblins still love treats and I enjoy seeing each and every one of them. I hope you all had a fun weekend celebrating Halloween! When I was 16, we studied Transcendentalism in English Literature. Thoreau and Emerson were our main focus of study. Many of the girls I went to high school with preferred Thoreau and Walden's Pond while I chose Emerson. Perhaps I wanted to be different but I really did like Ralph Waldo. I went to a parochial, all girl high school. It was strict but I enjoyed myself and I had some very good teachers. I think that we liked the transendental writers because they were a bit unconventional. It was the late 60's and it was interesting to read about people from the "olden days" who were just a bit different than the norm. Our music was getting pretty deep with meanings and we liked to discuss the lyrics at length. So too did we discuss Emerson and Thoreau at length. Perhaps many of the deep discussions we had in class and also among friends are why I was attracted to Philosophy as one of my concentrations for my degree. I do like to ponder and discuss. Today, I am thinking about what I want to do when I grow up, especially now that I have a college degree! I love a bargain; that is part of who I am. I have been feeling a new surge of creativity this fall and haven’t decided what to attribute it to. Is it the weather or those new vitamins? No matter, it is probably one of those mysteries that will present clues for me to see in the days or weeks ahead. But getting back to bargains I got a great deal on an autumn wreath today. It was 60% off the original price so after hemming and hawing, I put it in the shopping cart. It was the right size and decorated in a pleasing manner. It was just a little thin but that’s an easy fix. This was very close to the wreaths I liked in the seasonal mail-order catalogs. I found my way to other autumn decorating treasures and I found a pick that matched the leaves on the wreath! Knowing I had the rest of what I wanted at home, I took my turn in line. The clerk was one of the friendliest I have seen in that store in ages. She looked at the wreath and noticed it looked thin. Did I want a different one? No, I told her I would be fine with it as is. So she said she’d discount it further. She knocked an additional $3.00 off the sale price. I can’t remember the last time someone so willingly offered a discount like that to me. More interesting than the bargain though was how thoughtful this young lady was in providing me excellent service, something I didn’t expect! We will enjoy this wreath until the day after Thanksgiving when Christmas decorations come out at my house. Watching the changing seasons is like watching the changing of the guard. It started out so gradually I was amazed to wake up to dark clouds and persistent rain. It has been hitting the area hard with a reminder that summer has been gone for a month and soon this lovely autumn will give way to winter. The wind has been playing a tune on the wind chime; swinging it back and forth to play a fine tune and using all its chords. This is a delightful sound as rarely does the wind sweep past it in such a way, hitting all of the notes that intrigued me at the store enough to buy it! Many of the trees that curtain our back yard lost their leaves today; the leaves are lying on the grass now; shiny, wet and ready for the rake to pile them onto the garden to make compost for the soil next spring. The branches are exposed, giving us eyes to our neighbors once more. How much has changed since the leaves were new. I can see a puppy at one house, a new slide for another; incidentals that have enriched the lives of the families on the other sides of our fence. From their kitchens they can see changes we’ve made to our back yard too. Soon enough the snow will fall again and cover all the bare branches. As I think of the days ahead, I must remind myself to enjoy each day as it comes, wet, dry, sunny or cold. I want to find the beauty in each day as it unfolds its gifts. Today, the wind chime song, tomorrow something new will surprise me. For now, I think I will brew a cup of tea and listen intently to the music on this night. As the mornings get crisper, I am thinking more of the projects that I want to start sewing or crocheting. I visited A Gathering of Thought just now and she has so many lovely things that my mind is in a whirl! Stop by Rebecca's blog http://rebecca-gatheryeroses.blogspot.com/ and look around. She has an awesome giveaway of Pink Santa cards and tags. 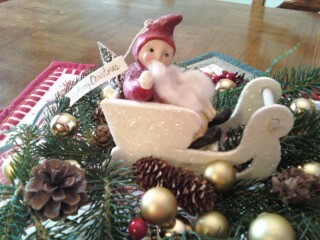 I collect Santas and I love pink so I am crossing my fingers that I can win! I am celebrating my seventh anniversary as a Breast Cancer Survivor. I do not have a particularly interesting story about my cancer, just my story. It began with my routine mammogram on October 2, 2003. The next day I had my routine six-month dental visit. The day after that, on Saturday, I participated in the Diabetes walk with my sisters. We walked along and I mentioned my two appointments and commented that I’d take a mammogram any day over a visit to the dentist! The following week I got a call that I needed to come have another mammogram taken because there were spots that they wanted to take a closer look at. It would probably be routine they said, but they wanted to be sure. So back I went and afterward, the technician and the doctor showed me the mammogram and the area of concern. They told me it could be calcifications, or it could be cancer. They were not positive which it was, so they wanted me to go to have a stereotactic needle biopsy the following week. So off I went to have the test done. First, I had to watch a video. If I wasn’t nervous before watching that video, it did the trick. I nervously went in and followed directions to a tee. I was to lay face down on a table that appeared to open near the top so my breast could go through the open space so the doctor could do her work. The worst part of the test was the shot for the anesthetic. The rest of the procedure was tedious at best, which was not as bad as the video at all! The doctor and nurse were very compassionate and I felt comfortable with them both. They were using a very small camera, taking pictures of their journey inside my breast. There was a lot of technology going on below me, and perhaps one could liken it to having a car getting a lube job done where the mechanic does everything underneath. After they took the core biopsy, they inserted a chip into my breast, just in case I had surgery so the surgeon would know exactly where the spot was. Talk about targeted procedures! Then I had yet another mammogram before I could go home. After I was dressed and ready to leave, the wonderful nurse, Patty, hugged me and pinned a very cute angel pin on me. I wore that pin for the rest of the day, along with my ice packs. You see they left that chip in my breast! What were they going to do if I didn’t need surgery? Leave it in or make me go back for another needle job? How inconvenient! I went to work the next day wearing my angel pin, and the day after, I wore the pin too. That day, the 16th was when I was going to find out the results of the test and I was getting anxious. 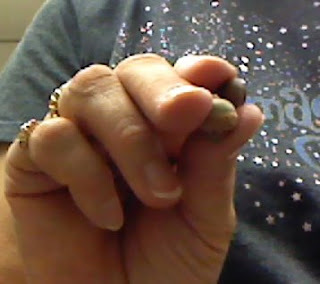 That day I was sitting in our employee wellness committee meeting and the pin broke and dropped onto my lap. I picked it up and was starting to feel a little numb. Was that an omen? I needed to find out so I called the doctor only to find out she was on vacation. I couldn’t reach anyone in the practice who could help me. I called the imaging center to see if they would tell me the outcome. I was transferred all around the place because they were not authorized to tell me the results of my own test. Finally I talked to someone who would call the results into the doctor covering for my provider. When he called and told me I had breast cancer I was pretty surprised. I didn’t expect it, not that anyone does really... do they? He assured me that I would have surgery, radiation and I would be fine. So, I hung up and trying to remain calm, I got up from my desk and helped a student who wanted to pay his parking fine! My boss took me in hand and had me use her office to call my husband; then I drove home and waited for him to come home. I tried to be as normal as possible. I would survive and I knew it; I really wanted to downplay it, which I did. I took things as they came along one by one to keep it from overwhelming me. Cancer takes over your schedule and your time is not your own for the duration of the treatment period. Today I celebrate and look back at who I was then, and see the resilience I possessed. I am filled with excitment and awe tonight. Miracles still happen and tonight I have been watching it live on TV! We have been watching for 69 days as 33 miners in Chile have been trapped 2,000 feet below the surface of the earth. What a joy to watch the first miner rise to the surface and greet his wife and young son. The world is watching as this young man emerged from a special capsule that is at this moment traveling back down below to take a third rescuer who will relinquish his seat in the capsule for the third miner to come home. I found myself holding my breath when the capsule emerged; it was only when I heard my own sigh that I recognized how tense I had become. God is so good! As my husband and I watched this rescue, I rememebered another rescue we watched in 1972 on our little black and white TV...the Sunshine Mining Disaster in Kellogg Idaho. 91 men died in that disaster. While the circumstances are very different I admire the courage of the men who work in mines. I also admire their families who every day say good bye to their husbands and fathers who go down below the earth to make a living. Fall is coming quickly...the leaves are turning to beautiful crimsons and golds. The days are shorter and our weather is changing too. It was very warm just yesterday a glimpse again to summer, a teaser, a brief interlude with warm sunshine and a picnic on the deck. Today the weather brought me back to reality. Rain, rain and a darker shade of blue. Indeed, we are falling to the cooler seasons. Am I really ready? I love the fall colors and the fall recipes using squash or pumpkin; I am excited for the new crop of apples! I love sweaters and cords and wool! Yes, I am ready. I can't wait to see what I end up with for my background...I am going to put it aside until tomorrow!